The center seats. The forward facing rows are great for couples. This is the first in a three part article of my trip from London to Bangalore. After exiting the lounge, I walked straight up to the gate which is right opposite the lounge entrance and immediately reached an agent, had my boarding card scanned and let through to the aerobridge. The experience of transiting the lounge to the aircraft was as seamless as possible without having the lounge connected to the actual gate. London Heathrow (LHR) to Abu Dhabi (AUH). EY 20. STD 15.00 STA 01.20 (+1). All times local. 16-Jul-17. Airbus A380-800. A6-APG. Seat 16A. Walking down the jetway I was reasonably excited about flying Etihad’s A380 because I had enjoyed my previous flights with them and with this flight I would have completed flying the A380 of all the ME3 airlines. I was even more excited flying this particular aircraft having seen her brand new at the delivery center at Hamburg in 2016. (Yes, my AvGeekiness is showing). As always a member of the crew checked my boarding card at the aircraft door and pointed me in the direction of my seat. I quickly stowed my baggage and took my seat. Interestingly my carry on would not easily fit in the overhead bin over my seat despite being a standard international carry on, I stowed it in the center row opposite my seat. 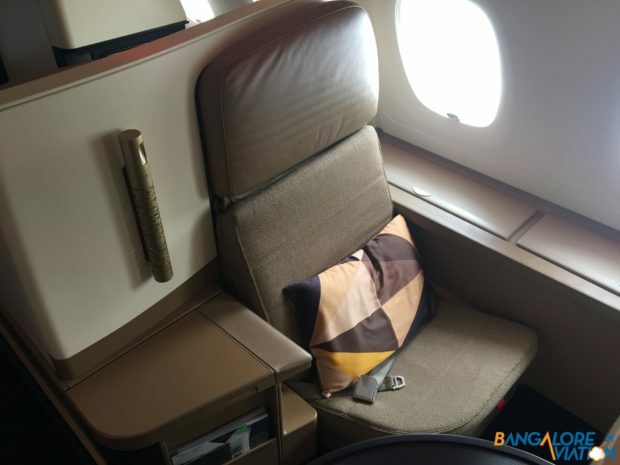 Etihad uses a staggered 1-2-1 arrangement for business class on their A380. Even numbered rows are forward facing and odd numbered rows are rear facing. Forward facing window seats have the seat closer to the window and the table island towards the aisle making them very private. Rear facing seats have the opposite arrangement and do not offer as much privacy. My seat 16A was a forward facing window seat. Leg room on in Etihad’s A380. A rear facing window seat. The seat is 20 inches wide and a bit on the firmer side. While the seat is comfortable, it does not really feel roomy like the seats on Qatar’s A380’s. 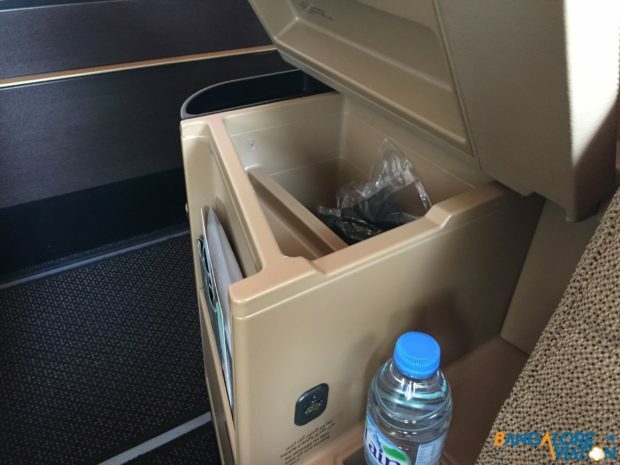 There are bunch of cubbies to store your stuff and I find the side table to be very useful to keep your phone, glasses, etc on during the flight. The side armrest flips open to reveal another cubby hole in which the headphones are placed. The side armrest with the large cubby under it. The seat reclines into a flat bed which is long enough for my nearly six foot frame. However the seat gives a very cramped feel when fully flat. The seat has multiple controls for various things, my favorite is the little touch screen that controlled everything from the lights to the window shades. The side table is particularly useful. On the left the touch screen is a centralized control for the entire seat. I was offered a drink about 10 minutes after taking my seat. I asked for a glass of champagne and a glass of water. 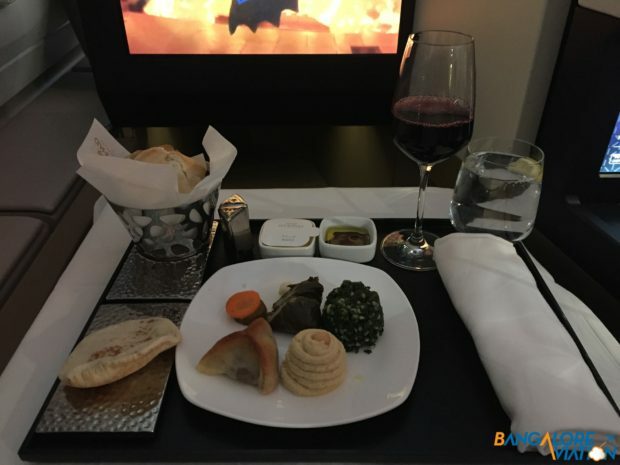 Surprisingly Etihad seems to have gotten rid of amenity kits in business class – very interesting cost cutting. Etihad’s IFE system has a large selection of movies, TV Shows, music and games with the screen being a respectable 18 inches in size. The touch screen remote can be used to control the IFE system as well as display a second thing entirely. 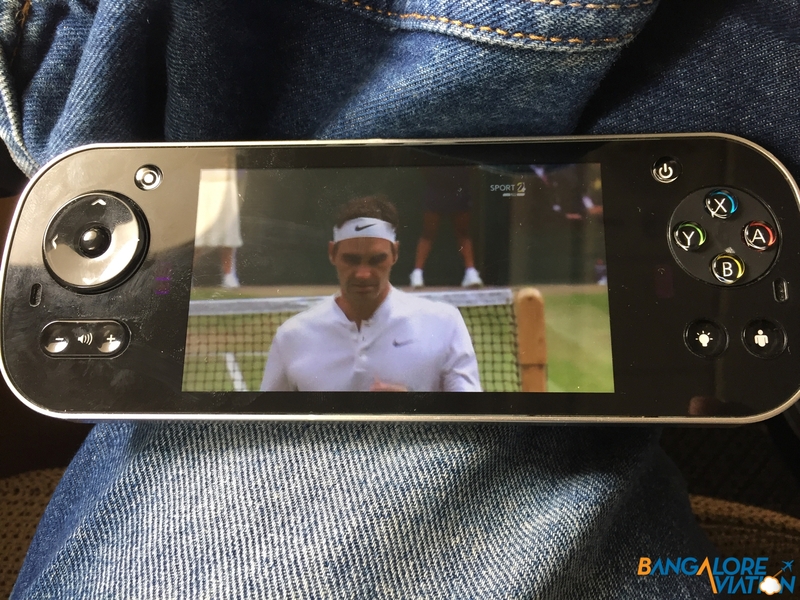 The airline also offers live TV streaming, so I was able to keep tabs on the end of the Wimbledon finals on board the aircraft. Live streaming of the match let me keep track of the score while watching a movie on the main screen. Unfortunately Etihad’s IFE system doesn’t switch on until the aircraft begins pushing back, until then the screen just plays a series of annoying ads. As always one of my favorite features of the IFE on any A380 is the tail mounted camera. 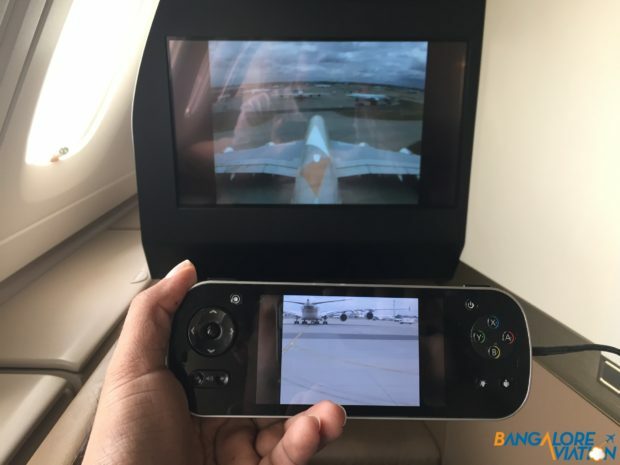 On Etihad’s IFE you can watch two views at a time – one on the main screen and one on the remote. One of the few airports where you get into a queue of A380’s. Ahead of us were Qatar, Thai and Singapore Airlines A380’s. After we took off, the flight attendant brought me another glass of the champagne along with a bowl of nuts. He also took my dinner order, while taking down my wine selection for dinner, he suggested another wine which pair well with the food. He asked me when I would like my meal served. I asked for my meal to be served after one and a half hours and it was served promptly at the time I had asked. I had started with the Arabic mezze which was very average but came with a absolutely fantastic piece of bread. My main course was a steak which was good and flavorful but was a bit on the rubbery side. I have definitely had better steak on airplanes before. Steak with beans and potatoes. For dessert, I had ordered a chocolate lava cake which was absolutely fantastic, I was very tempted to ask for one more. The fabulous chocolate lava cake. After dinner, I walked around the cabin a bit and then lay down to catch some sleep. 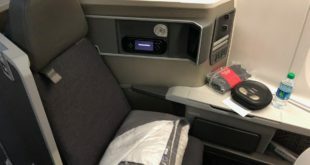 Unfortunately it was a disturbed sleep due to two reasons – the first is that Etihad keeps it’s cabin annoyingly warm and with no individual air vents I found it uncomfortable. The second were a family with three kids that were creating a a ruckus and their lazy parents could not have cared less about trying to make their children behave. While landing the IFE begins to display the gates for connecting flights. Despite these issues I was so exhausted, I had a broken sleep until being awoken by the crew for landing. The aircraft landed uneventfully and taxied to a gate pretty fast by Abu Dhabi standards. 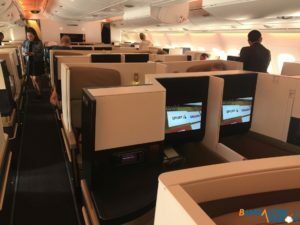 I was really looking forward to my flight on Etihad’s A380 – my previous flights on the airline as well as experiences on the other big ME3’s A380’s left me with high expectations. 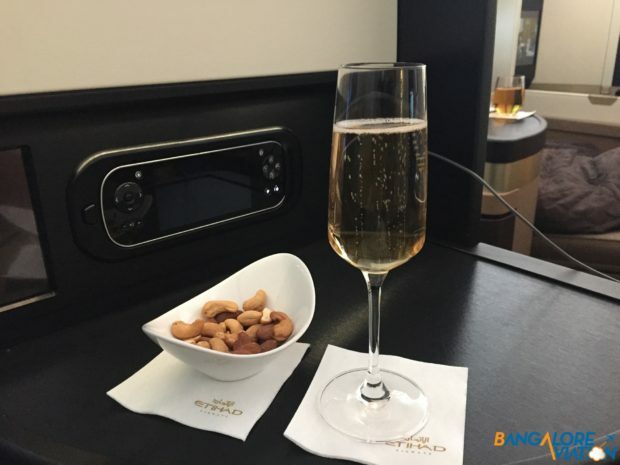 My flight on Etihad was quite average with good service from the crew despite the very large business class. The airline keeps it’s cabin a warm to the point of discomfort and the seat while modern and reasonably comfortable is definitely not my favorite hard product. 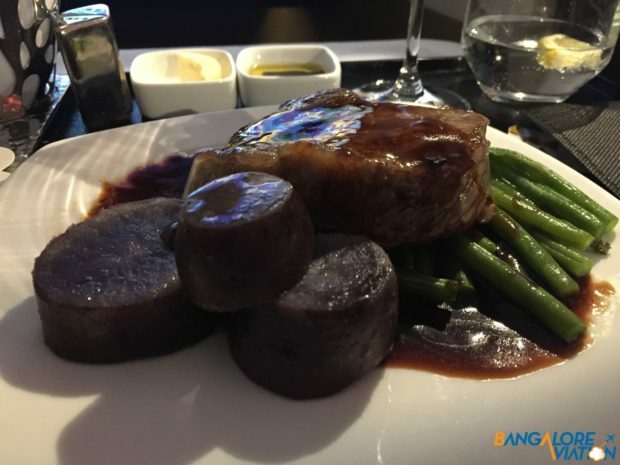 The meal service definitely needs improvement and the airline seems to be in the middle of a cost cutting exercise, the effect of which remains to be seen. The airline has set up a fantastic lounge service at Heathrow and their ground service at the terminal was very good. The only blemish was the botched chauffeur pick up – which I am still waiting for the Etihad service team to respond to. Next up will be connection from Abu Dhabi to Bangalore.